I just love a good taco salad, and one of the best I've ever had surprisingly comes in a bag at the supermarket. Dole's Taco Toss is a ready to eat complete salad with crisp iceberg and romaine lettuce, red cabbage, carrots, radishes, crispy tortilla strips, shredded cheddar cheese, and a cool salsa ranch dressing. Sure the bag serves 3.5, but I always just dump everything into a large bowl, grab a few forks, and proceed to mix the fresh ingredients together. THE VERDICT: Yum! The dressing that they use for this salad is extremely tasty and very fragrant. All the greens are always very fresh, and the radishes are a nice touch (you don't see them used much in bagged salads). There isn't much cheese, but that's OK - there is plenty of flavor with just the veggies and dressing. 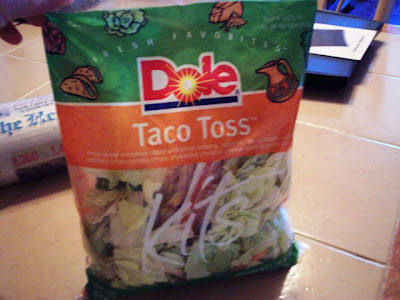 If I'm lucky enough to spot a Dole Taco Toss at the market (they're usually gone by the time I get there), I always try and grab one. It seems they are very popular!